First, you have to check out this YouTube video called "Martin Luther had a Dream" sung to Nelly's "Just a Dream." My students kept asking to watch it again. It might become a daily thing as we continue to talk about him! It's pretty catchy. 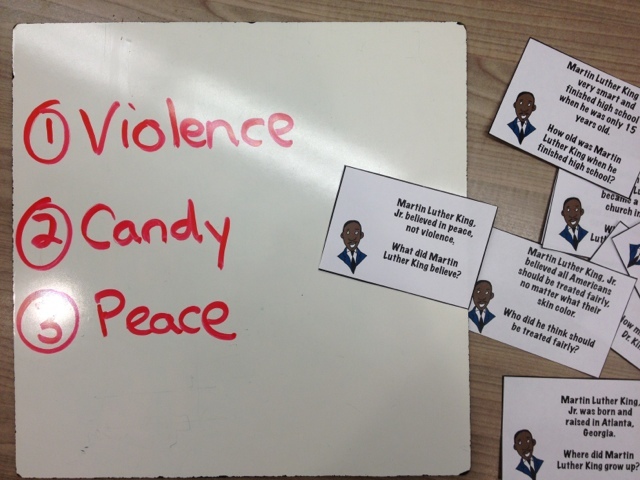 There is an awesome Brain Pop video on Martin Luther King Jr - and it's a free one! I love Brain Pop :) I usually use Brain Pop Jr. with the levels of students I have in my history class - but I just paused it frequently and discussed various parts of the video so it worked well. 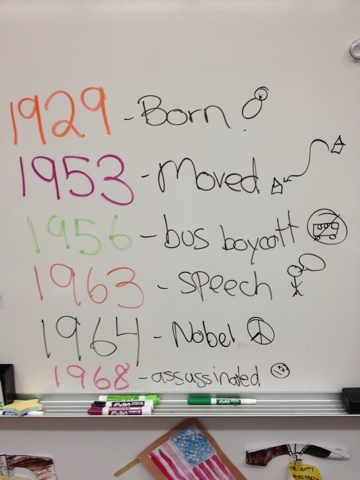 I used the timeline worksheet found in Laura Candler's TPT freebie of MLK Jr. worksheets to go along with this Brain Pop video. As we watched the video we would stop it as soon as we heard a date and then filled in the correct box. I wrote these on the board as we found them - check out my talented illustrations! 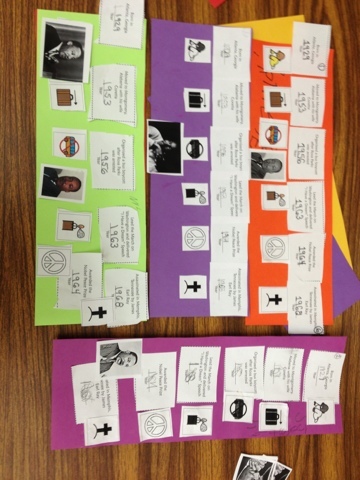 Here's another amazing TPT project on listening for details from K. Ratliff. I love these little cards. Each one has a statement about Martin Luther King Jr.'s life and then asks a very simple question based on the statement. Below is an example of the choices I give students after reading a question such as this one. Some students don't need choices at all...and other students I know they will just pick the last one I read. The following activities are scheduled for the rest of this week. I'm excited to see how they go! I'm planning on using this Just/Unjust sorting activity. It will be interesting to see what my kids think is fair / not fair. Here's a 5 page book with an assessment page! I really like this one because it has fill-in-the-blanks to complete the sentences on each page. I'll have some of my students write in the blanks and other students glue pictures with symbols in the right spots. I also love this Mini MLK Reader from Simply Kinder. If you have Boardmaker, I found some great activities on Boardmaker Share too. There's a one page story written with symbols and a page of fill-in-the-blank questions to go along with the MLK story. So, what are you doing for Martin Luther King Jr. Day? I love the simplicity of your timeline! Then my third graders can add in lots of details. Thanks for sharing your MLK ideas. I'm so glad I found your Blog! Thanks for all the MLK jr. Day Ideas! I will def. be incorporating them into my classroom! I'm so glad you commented so I could discover your blog! :) Glad you will be able to use some of these activities. I love finding and sharing ideas!! Brie, This just saved my night, your the best! 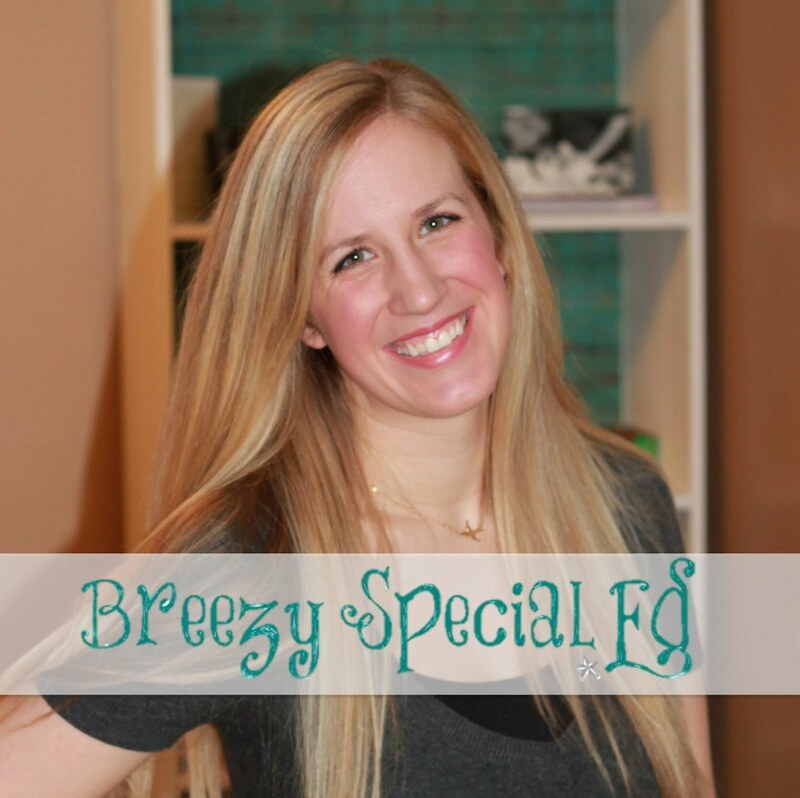 Thank you SO much for sharing so many great ideas and resources, Brie! I'm definitely going to use some of them in class this month! I love how you did your timelines, too.